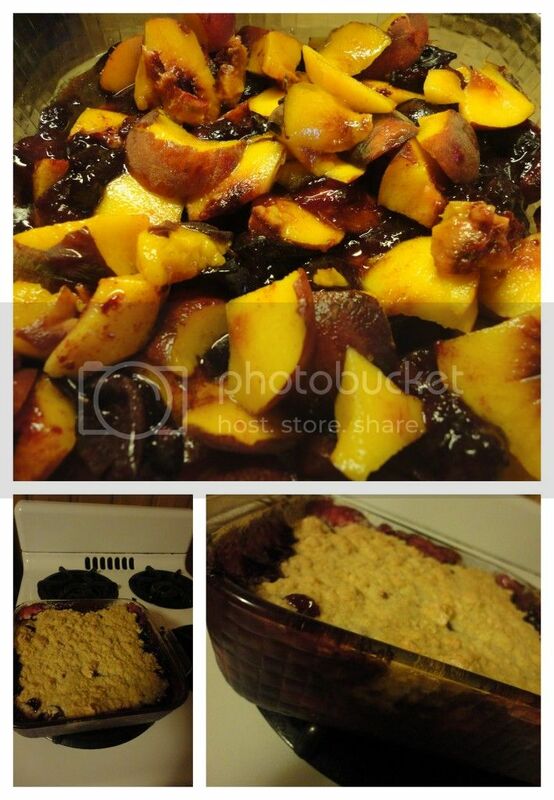 I've been happy to return home and enjoy the fruits of my neighbor's CSA, the only agreement I've been required to make is to share anything made with their CSA share with them ^^ We thoroughly enjoyed sharing this cobbler of mixed peaches and plums. Toss 6 cups chopped peaches and plums with 1 Tbsp. Cornstarch, 1/4 cup Brown Sugar, and a dash of Cinnamon. Tumble into a prepared square baking dish. For topping, mix together 1 cup Flour, 2 Tbsp. Sugar, 1 1/2 Tsp. Baking Powder, and 1/4 tsp. Salt. Cut in 1/4 cup butter. Separately, mix together 1 Egg and 1/2 cup Milk. Add to the flour mixture, stirring until just moistened. Spoon on top of the filling. Bake 20-25 minutes until golden brown, cool for about an hour before serving.